There is no doubt that wedding is one of the most important and memorable days in your life. So many people will take wedding photos to record this special days. So how to show these pictures in an interesting way on iPhone. Creating a wedding slideshow with wedding music, transitions, pan&zoom and other effects sounds a good idea. 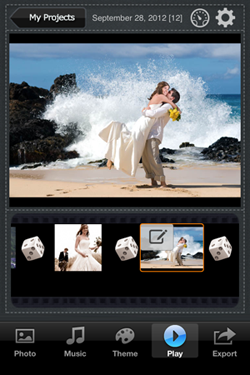 In the following article, I will show you how to make a stunning wedding photo slideshow on iPhone with Photo Slideshow Director HD for watching them anywhere you go. If there are many people , you can connect your iPhone with HDTV for enjoying on large screen TV with friends. Also after finishing the slideshow, you can upload the slideshow to Facebook or YouTube from the app directly for sharing with the world. 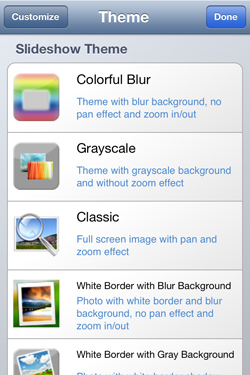 To do this, all your need is an iPhone app—-Photo Slideshow Director for iPhone. Here is a tutorial to show you how to create an unique slideshow of your wedding photos on iPhone to memory those special events and perfect moment. Launch Photo Slideshow Director on iPhone then tap “new” button to create a new project. 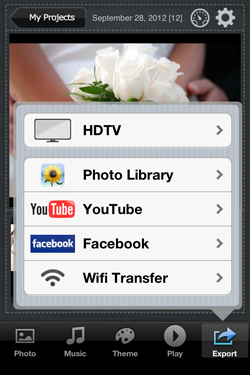 Then tap the first “Photo” icon, you could import your wedding photos from iPhone Photo library. Also you could use photos in Web albums, including Picasa, Flickr and Facebook. If you like, you can take a photo with your iPhone camera and use it. 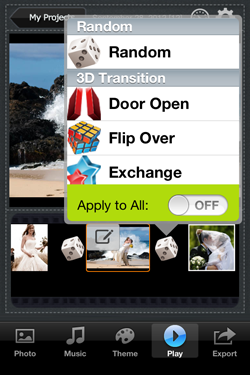 Tap any one of photos, you can arrange photos order, delete photos, customize pan&zoom effects, and edit photos. With its built-in photo editor, you can fix your photos before publishing them. Once photos imported, random transitions will be applied between them. However you can change them by taping the dice between photos . The program also has a build-in photo editor, so you can fix your photos before publishing them. Meanwhile you can tap the “Setting” option on the right top of the interface to set the transition time for slideshow presentations. If you have any favorite songs for wedding now you can also add them into this slideshow as the background music. It’s very easy, save songs on iPhone then tap the “music” icon at the bottom of the interface to add music . Meanwhile please choose the background theme by tapping the “theme” option then you can find some colorful and beautiful themes there. How to create a photo slideshow on iPad.